Photography in the Israel Museum. Can it be? Several times I have criticized museums that do not allow photography of archaeological artifacts. A photo such as the one below can be helpful to teachers who prefer to have their own photos for use in teaching. The highly decorated Caiaphas Ossuary was discovered during the construction of a water park in Jerusalem’s Peace Forest. The remains of six individuals were found inside the ossuary including that of a man about 60 years of age. 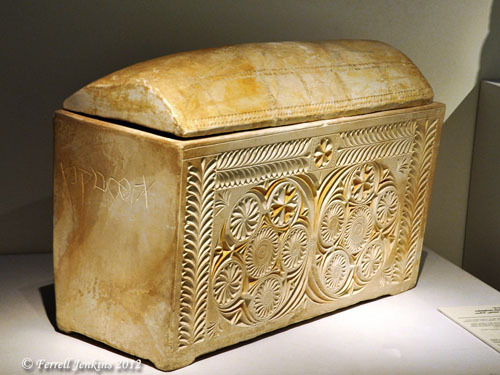 The name of Caiaphas is inscribed on both ends of the “bone box.” The single line visible in this photo is translated “Joseph son of Caiaphas.” Many scholars believe that this is likely the high priest Caiaphas before whom Jesus stood prior to His crucifixion. The Caiaphas Ossuary in the Israel Museum, Jerusalem. Photo by Ferrell Jenkins. This entry was posted in Archaeology, Bible Places, Israel, Photography, Travel and tagged museums. Bookmark the permalink.